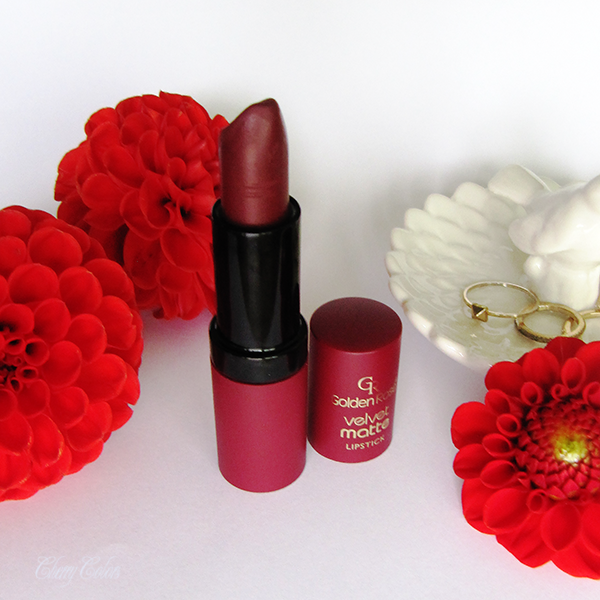 Golden Rose Velvet Matte Lipstick N.23 - Cherry Colors - Cosmetics Heaven! 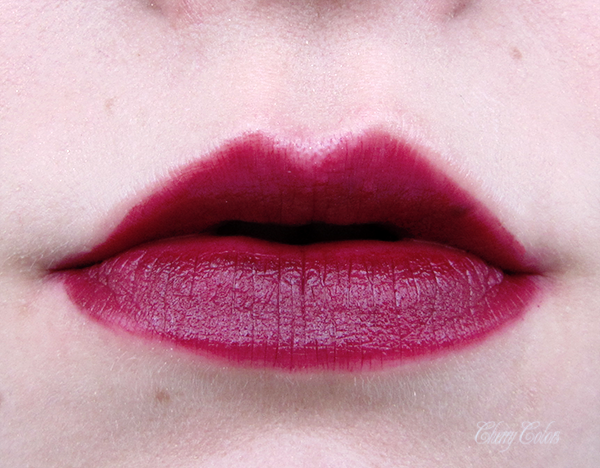 Today I'll be showing you lip swatches of this lovely dark burgundy lipstick by Golden Rose. Golden rose is a new brand on the Slovenian market, but it's a well-known brand in the world. Their mat lipsticks are very sought after and also their amazing nail polishes (they have so many of them!!). After the BBMULJ 2015, we got a pretty envelope together with a nail polish and the mascara from the Golden Rose. In the envelope, there was an invite for us to pick a date and come get our very own lipstick from them. I think this was a great idea and it got me all excited. I heard many great things about their matte lipsticks so I decided to get myself one. The choice wasn't hard since I knew I wanted the darkest red available. And of course, I'm talking about the shade N.23. They sadly don't have names, just numbers. I managed to maim my lipstick the very fist day (it's not pointy anymore haha), but it does still work wonderfully. Here you can see it on my lips. I had to play with the lightness of the pictures since they all came out too dark. 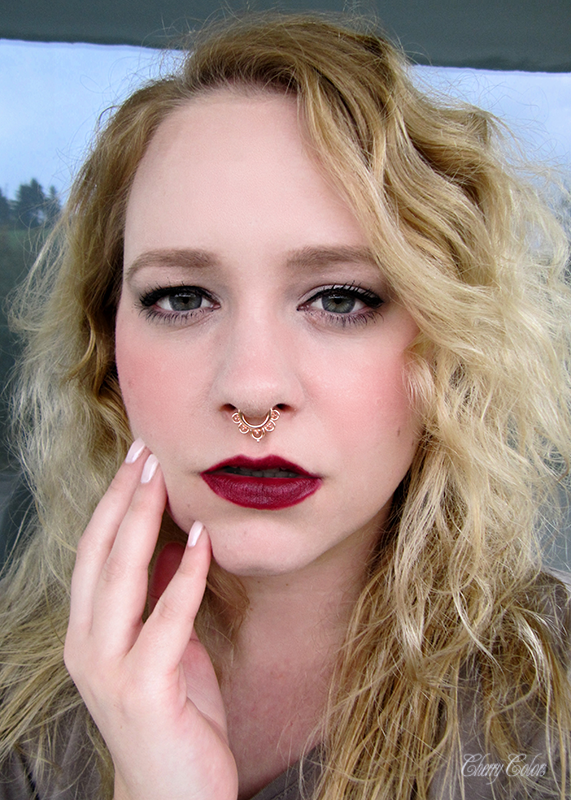 It's actually the darkest and most wearable lipstick I own. Okay, I also have a violet one, but I wouldn't wear that to go grab a coffee. Firstly, you really have to be careful with the application, because once it's on, it's there to stay. Secondly, This lipstick doesn't budge after a period (30 min). It won't go anywhere. Thirdly, you can drink and eat, but you will have to re-apply the lipstick if you eat anything oily. Fourthly, since it's a matte lipstick it's quite drying and clings to all dry patches on your lips. Overall I think it's a nice lipstick that looks wonderfully and will be my staple during the colder months of the year. I don't remember the exact price, but if I got it correctly these lipsticks are about 5€. Less probably.